This uptown Johns Creek gastropub offers comfort fare and mixed drinks on the sweet side of life. : Oswald Morgan's gastropub offers a comfort-food menu that includes hamburgers, fresh salads, velvety mac 'n' cheese, and a house version of Canadian poutine that takes fries and layers them with braised beef, gravy and a slightly nontraditional mozzarella (typically, the dish is topped with cheese curds). 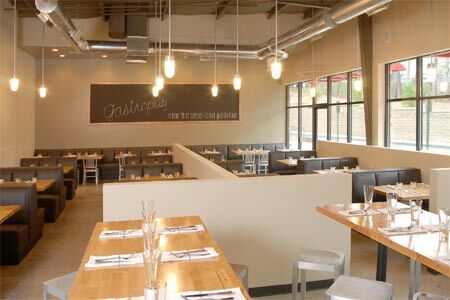 The very "intown" interior mixes industrial modern with roomy booths, warm lighting, generous fenestration and a tantalizing view of the open kitchen. The menu is quite flexible: assemble a main dish of your own design by sliding pan-roasted salmon ($7) next to a side of white bean ragoût ($4) and sautéed fresh garlic spinach ($4). Take the family, as the kids’ menu is a good value. Desserts are attractive, with crème brûlée and rum-glazed pineapple upside-down cake and ice cream the best choices. Beers are better than the selections on the wine list, and if you like sweeter drinks, the Kozmopolitan might hit the spot. The reputation rests squarely on the inventive mixed drinks. Caramel pear martini anyone?